…is headquartered in Overland Park, KS – in the Kansas City metro area - which serves as the hub of its northern hemisphere business. Its original office in Perth, WA, Australia, now serves the southern hemisphere. The company also has offices in the UK and Switzerland. …encompasses 4 labels, 3 bridal and 1 bridesmaid, each with original designs that can be found across the United States, Canada, the UK, Australia, New Zealand, and throughout Europe. …was awarded three of the most coveted DEBI Awards - the ultimate recognition within the global bridal industry. Essense of Australia for “Best Bridal Manufacturer of the Year”, Stella York "Best Collection of the Year (Design Innovation), and Sorella Vita for “Design Excellence in Bridesmaid”. "Relationships matter. 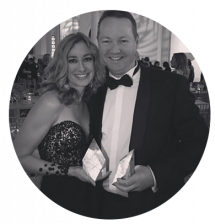 They are integral to our success both with employees and retailers"
Founded over 19 years ago in Western Australia, bridal fashion house, Essense Designs has grown into a worldwide presence and industry leader within the wedding trade. Co-Owners and founders, Wayne and Martine Harris, began with the mission to exceed brides’ expectations through designing, manufacturing, and wholesaling to retailers gown collections with fashion-forward styling, superb fit, couture finishing, and extraordinary customer service. This commitment and holistic focus remain unaltered throughout the company’s growth and success. Team members come from a variety of experience in both the fashion industry, and other key areas of expertise. The economically-stable bridal fashion industry paired with the unique company culture of Essense Designs, attracts exceptional talent which has helped create it’s ongoing growth. The flexibility and responsiveness that Essense has to industry trends and best-practices creates not only company growth, but also continuous opportunities for employees. You are recognized and encouraged to pursue your key talents, which create an exciting and ever-evolving career environment. First and foremost, I enjoy the people. We are growing so rapidly, there’s a mentality that “we’re all in this together” and we’ve got to roll up our sleeves and work together to figure it out – find the best, most efficient solution and if it means we challenge each other’s ideas and concepts along the way, we know that makes for a stronger solution in the end. It is truly rewarding working with so many passionate individuals that are dedicated to personal and professional growth. Essense is a unique place where desire, creative thinking, and fun permeate throughout the building.